After identifying failures in previous portable slow cookers, Crockpot came up with SCCPCTS605-S Slow Cooker addressing all the issues in it. The company calls it upgraded version of 610-S. These two slow cookers are very similar in design and almost identical in dimensions. The capacity of six quart is also same. In this article, you’ll learn what enhancements 605-S which was missing in previous versions. 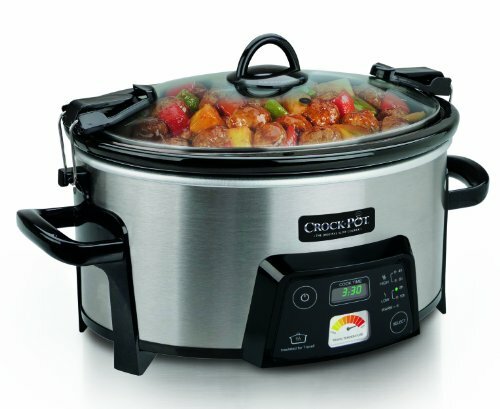 Following are the features and specifications of this slow cooker. The stoneware is designed to retain the heat inside. The slow cooker also has a temperature gauge. These two tools keep the food warm for an extended period of time. This is very helpful when the time of cooking and time of eating has a longer interval in between. This attribute is very ideal for dinners and lunch of holidays, meetings and social gatherings. The temperature gauge is a very helpful tool in giving live display of how much degree of hot your meal is. It works even after you have taken the plug of slow cooker out of socket. Whenever you think the meal temperature has gone lower, you can select from any of the four automatic options to warm it again. The Heat-saver stoneware allows the slow cooker to consume less energy. It retains the heat for as much as 30% longer time than the previous versions so you do not need to warm the food for a substantial period of time after cooking. All its components are made especially for making it portable. You can easily take your cooked food in this slow cooker with ease. It will not tire you and will give you a home-made delicious meal far away from your house. We have already discussed the stoneware and temperature gauge features which maintains the food temperature and give you a live update on its temperature respectively. The light indicator provides an update on a glance as the color of light changes from red to yellow as the temperature decreases. When the cooking time selected is finished, the cooker will switch to warm mode on its own. The lid of the cooker can made sealed tight through hinged locking. The rubber gasket in the lid prevents from the danger of mess which is very common in traveling. The carry of slow cooker is very easy with the help of solid grip handles. They are sturdy, large in size and strongly embedded with the cooker. The stoneware apart from heat retention can also be used as a dish to serve the food. The handle is made of an insulator so you can easily serve the food with it as well. The cooker is finished with accent of black. The material used is stainless steel. The shape and design complements the look of cooker and makes is a very stylish option. The dimension of cooker is around 16×10.2×16 inches. It comes with a limited warranty of one year. The cooker has a user manual included for using the four automated heat setting correctly. The controls are very easy to operate. The cooker starts with the on / off button and then starts cooking with food when you select one of the four timers. The time display shows how much time left in cooking. When the cooking is finished, warm mode starts and the timer shows how much time has passed in this mode. The lid can be tightly locked and with a gasket avoids the mess during transport. Clips allow you to keep the cord safe when not in use. Automatic shift to warm mode keeps your food warm for a longer time. 610-PS allowed heating time from 30 minutes to 2 hours in both low and high setting. This is not the case with 605-S. It has more rigid four options. It is an ideal choice for someone new to cooking. You do not need to apply any guessing on how much to heat. You simply take the recipe and go to one of the four choices mentioned and your food is ready. The 605-S can also be called as the consumer demand version of 610-S. The heat maintaining and serving dish stoneware, gauge of temperature, carrying and serving handles, and tightly closed lid with a rubber gasket, it has got the exact changes which the customer needed to have ease in their cooking.